The wines are also an expression of the environment from which they come from, the terroir, a concept that combines factors such as climate, soil conditions, tradition and lifestyle of the place and the people. That’s why the wines must reflect the absolute uniqueness of their places of origin. Lecburgh winery is located in one of the most relevant wine regions of Transylvania. On its slopes and hills, the grapes ripen in preferred climatic conditions. Sheltered from the Carpathian mountain range and blessed with 1,800 hours of sunshine, with warm days and cool nights during the ripening period, our region provides a wide selection of fine wines. Thanks to its climatic and geological characteristics, and despite the limited wine-growing extension, the territory of Lechinta has earned its own designation of origin (DOC). The wine village of Saniacob of Lechinta is located in the crossroads between the city of Bistrita, Cluj Napoca and Tirgu Mures. Here, where the wide valley of Lechinta spread towards the south, the vineyards lie on the slopes of natural amphitheatres. The soil is made of clay with mineral deposits. The quality of the Lechinta wines DOC is primarily insured by the climate as well as by clays minerality . 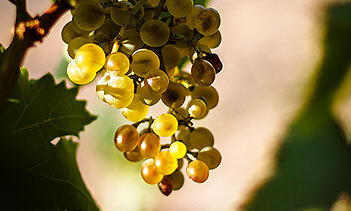 Its natural conditions are among the most favorable for the cultivation of white grape vines from which prestigious aromatic wines came from with a distinct freshness and fruitiness. The wine-growing area ‘’Lechinta‘’ is located in a hilly region of the Transylvanian upland, crossing the 47th parallel of north latitude. The hilly region includes in the eastern part south Carpathian hills and towards west the uplands hills with an altitudes ranging between 300 and 500 mt., with moderately or strongly inclined slopes (5 ° -25 °) which are not able to retain water while the vineyards on the southern slopes with the natural amphitheater characteristic are shaped in terraces with a great landscape suggestion. The specific climate of the area is characterized by the appearance of morning mists already in the late summer period as well as during autumn, with extreme changes in temperature between day and night which leads to a slow and intense grape ripening process that maintain aromatics and acidity levels consistently high, these elements distinguish the inimitable wines. Typical temperate climate, continental moderate. Sunshine hours in the vegetation period: from 1200 to 1800. Winds: In winter winds from North, North East leading masses of arctic air and snow. In summer winds from South, South West leading oceanic air masses.